Neurodevelopmental disorders (NDs) are currently thought to be caused by either genetic defects or various environmental factors. Recent studies have demonstrated that congenital NDs can result not only from changes in DNA sequence in neuronal genes but also from changes to the secondary epigenomic modifications of DNA and histone proteins. Thus, epigenomic assays, as well as genomic assays, are currently performed for diagnosis of the congenital NDs. It is recently known that the epigenomic modifications can be altered by various environmental factors, which potentially cause acquired NDs. Furthermore these alterations can potentially be restored taking advantage of use of reversibility in epigenomics. 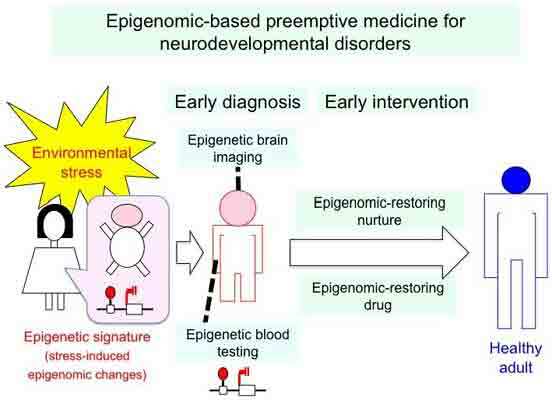 Therefore, epigenome-based early diagnosis and subsequent intervention, by using drugs that restore epigenomic alterations, will open up a new era of preemptive medicine for congenital and acquired NDs. Neurodevelopmental disorder, Autism, Epigenomics, DNA methylation, Acquired, Preemptive medicine. Department of Epigenetic Medicine, Faculty of Medicine, University of Yamanashi, Japan.